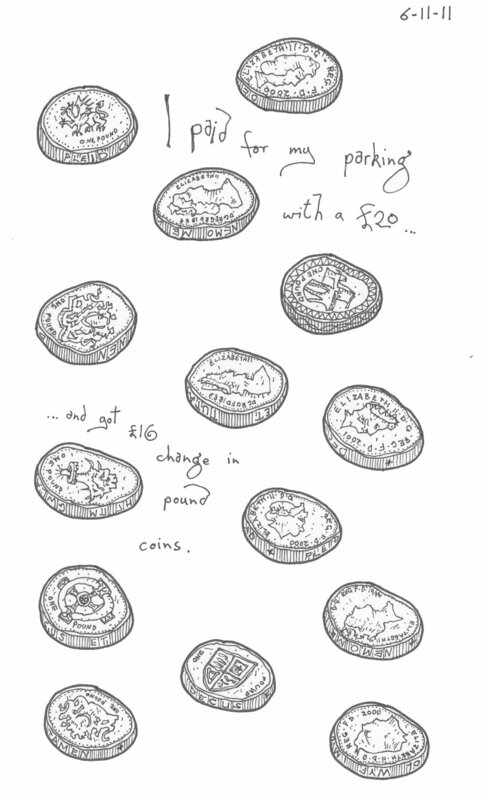 I left the Sketchcrawl Sheffield meetup, a couple of weeks ago, with a pocket full of pound coins and a head full of ideas. – Work in other sketch books other than my ongoing ‘day book’; having a sketchbook with a theme. I have one or two ideas already, but I’m keeping those under wraps for the moment. – Experimenting a little more with hatching and shading. Just to add a bit more texture. – Not getting hung up on ‘having’ to start a new page every day. Weekdays/workdays I think I’ll try and concentrate on revisiting work I’ve already started, but not finished. Otherwise my sketchbooks end up being full of unfinished scribbles. – Trying to use a wider range of materials – I’ve already got in mind a bunch of materials that languish, unused, in a box at home. It’s time to break them out of semi-retirement! – Focusing more on adding text to my drawings, or at least somewhere on the page. To add description and, ironically, colour, to my drawings.